Getting to Bury from Lincoln is relatively easy. It barely takes two hours to get there and the ground is easily findable once in Bury. Parking is also very plentiful, although it is mainly street parking. In previous years, City had been in the Manchester Road End Stand and it’s safe to say that the view out of their was pretty poor because it was so far back from the seats. However, this stand was now for home fans only due to a poll on the official site. To be honest, I was a little annoyed through leaving this end because it was a good away end, you had plenty of time to pick your seat and you could get a good atmosphere in there. For this single game, the away fans had been allocated one side of the club's main stand and it's like being in a totally different ground. The seating in this stand is also quite good, however, what lets it down if the completely random mesh covering 6 or 7 seats so you have to either walk the long way around or did it army style under the mesh. The view from this section was amazing and as you can tell from the pictures below, offers a great view of the action. 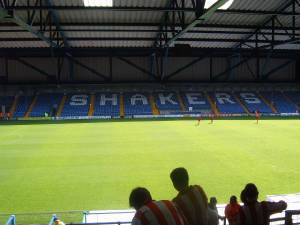 This stand is shared with the home supporters. Then away fans were moved again into the Cemetery End. This was a good stand and the view was ite decent. You are relatively close to the pitch compared to the Manchester Road End. The one bad thing about this end though is that if you go in large numbers, you could end up sitting with a huge cement block restricting your view of quite a lot of the pitch. 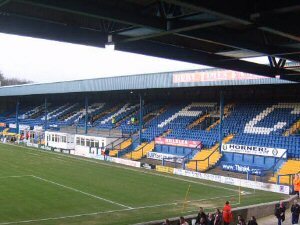 The one thing I find curious about the fans at Bury is that the majority of them want to sit in the worst end of the ground. 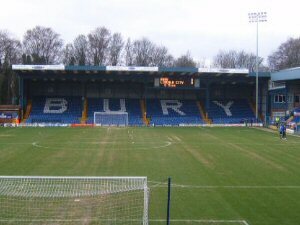 There is no atmosphere at Bury and the only noise you'll really hear from them is the occasional moan that accompanies around 1,500 arms waving. 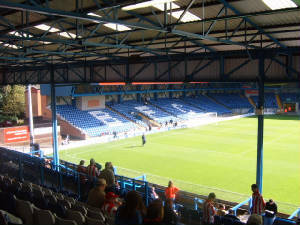 Overall, I actually like Bury, especially from the view that you get in the side stand, it is one of the best views available in the division and only Rochdale can really rival it. I would go to this ground again randomly if given the chance, it's relatively close to Lincoln and the ground has the thing that means a lot of grounds these days, the feeling that football just feels like it really means something around here, I can't really describe it, so I won't bother.